The ratio of male suffering from hair problem has increased these days the majority of male suffers from Androgenic Alopecia Areata or male pattern baldness at the age of 50 but some also suffer it at the age of 25. Hair loss occurs due to hormonal changes, strong stress, side effects of certain medications. 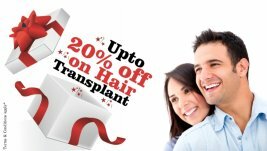 Hair implant is a process that restores your loss hair and helps you to establish good look and personality with good hairs. Though performed under hair specialist this process also involves high factors of risk. The hair loss drug may increase the risk for prostate cancer. No one can ever guaranty perfect positive results. Before taking a risk of treatment it is necessary to consult specialists and must choose the best hair fall treatment for better results. NUTRITE Hair Fall Treatment is a total natural hair loss treatment. It is meant to stop DHT formation that stimulate hair growth and stop hair loss. It has vitamins and nutrients that make it safe and reliable for both men and women. There are no known side effects.